How many people can sleep in a canvas wall tent? Whether you will be sleeping on the floor or sleeping on cots. If most of the people are adults or children. If the tent will be for sleeping only, or whether you need additional space to congregate or to cook. Whether you will be using a winter stove. If your canvas tent is going to be for your family or a group. Cots are great for comfort, but take more space. The average cot is about 32 X 76 (inches) which is about 17 square feet. So a 13 X 16.5 foot tent could hold 12 cots. However, you would not have room for a stove or be able to maneuver around. Unless it is an emergency situation you don’t want to stack your cots or people so tight they can’t get in out of the tent comfortably. The great thing about a wall tent is the ability to have a wood stove and stay warm in the winter. Obviously, if there is a stove, then there is less room for sleeping. In addition to the stove taking up space you don’t want to place cots or anything else that can burn within two or three feet of the stove. In general, bigger is better, but size does add weight, costs, and may require a larger stove. Wall tents are great for winter camping and most people find they spend more time inside their canvas tent than they expected. Having a slightly larger wall tent gives you the ability to move around and still have space for your gear. I would not recommend a canvas tent smaller then 13 x 13 if you plan on using a stove. If you assume your wood stove needs 35 SF, that is basically a 6 x 6 area. With a 10 x 10 wall tent, you would have 4 feet of space to use. 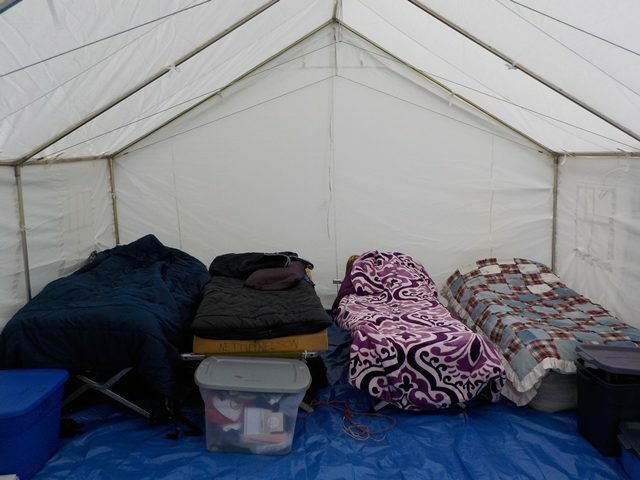 This is OK as long as you’re only planning on having 2 cots in the wall tent. If you are on a boy scout or family trip and everyone can cozy up tight, you will find you can fit a few more people into your canvas tent. However, if you’re an outfitter guiding in hunters and each one of them has their own cot and needs some elbow room, I would go with my recommended sleeping capacity.